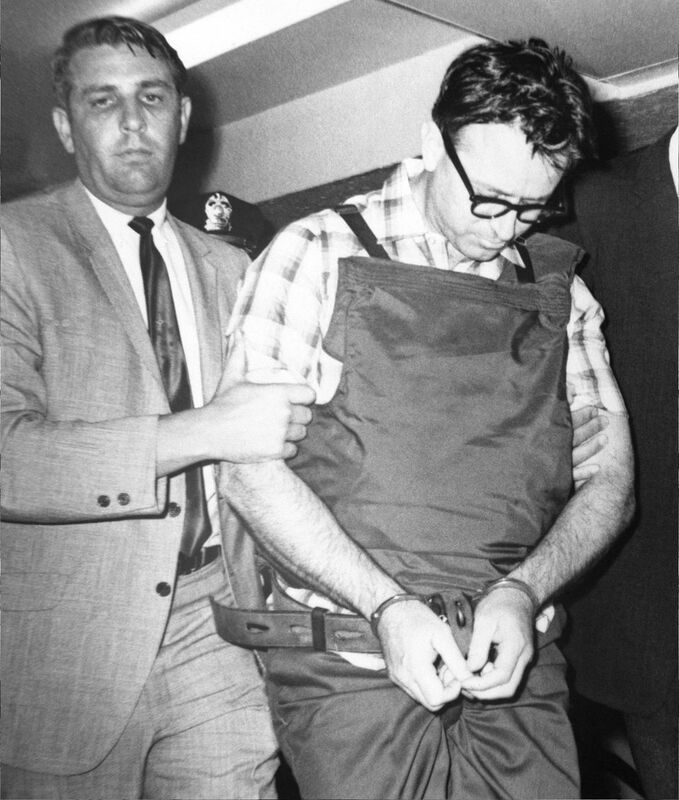 James Earl Ray, Martin Luther King’s assassin, being led to his cell in Memphis after his arrest in London, June 8, 1968. The FBI put him in a bullet proof vest, they weren’t going to take any chances after Lee Harvey Oswald. Martin Luther King was shot and killed by a sniper on April 4, 1968, while standing on the second-floor balcony of the Lorraine Motel in Memphis, Tennessee. On April 4, 1968, Ray stood in the bathtub of a shared bathroom, balanced his rifle on a window ledge and shot King as the civil rights leader was standing on a balcony outside of his motel room. After shooting King, Ray immediately fled, setting off a manhunt that would last more than two months and cover five countries. At the time, it was said to be the FBI’s most expensive and biggest investigation in its history. Finally, on July 19, 1968, the FBI caught up with Ray in London and extradited him to the United States. Ray pleaded guilty to the murder, something he’d spend the rest of his life trying to reverse, and was sentenced to 99 years in prison. Exactly what led James Earl Ray to kill Dr. Martin Luther King Jr. continues to be a source of debate, as does his role in the murder. Evidence does suggest that Ray had little stomach for the integration policies that were sweeping the country. In addition to his segregationist beliefs, he also saw a big payday, some historians have said, in killing black leaders like H. Rap Brown, Stokely Carmichael and, of course, King. Toward the end of his life, Ray, whose sentence had been extended to 100 years after he escaped from prison in 1977, had the support of an unexpected ally: the King family. Not long before Ray’s death, Dexter King, Dr. King’s son, visited the man presumed to be his father’s killer. Ray, who was feeble and sick from hepatitis C, was asked by King about his involvement in the assassination. “I had nothing to do with killing your father,” Ray said. “I believe you,” Dexter King responded, and shook his hand. Ray died in prison on April 23, 1998, at the age of 70, from complications related to kidney disease and liver failure caused by hepatitis C. He was cremated and his ashes were flown to Ireland, the home of his family’s ancestors.